A Special Area For Designers and Publishers to playtest their latest creations and for Players to assist! Double Exposure will be using their unique formula of reversing the focus of the games - allocating eager players to the requests of the Designers and Publishers! Scores of Designers and Publishers will present their prototypes for playtesting at the FEPH, and Gen Con attendees will be able to get FREE tickets to try out new concepts with the genres and mechanics they are interested in. The FEPH will be running throughout Gen Con, from 8AM Thursday to 2PM Sunday. All Role Playing Games, Story Games, Board Games, Card Games and Wargames are welcome, and scheduling will consist of two-hour slots from 8AM - midnight each day. Designers and Publishers: This is your opportunity to officially tap into the giant pool of players at Gen Con - put your games on the tables and Double Exposure will find you the people you want to playtest with - give us your needs and we'll fill them! Players: Help to shape the next generation of games - take a look at the offerings in each slot via short descriptions, and pick a new game that you can assist in the development of. Designers and Publishers might even put your name into the playtest credits when they release their game! Last year at the FEPH, thousands of players hooked up with over 130 Designers and Publishers. Now you can be a part of the magic! 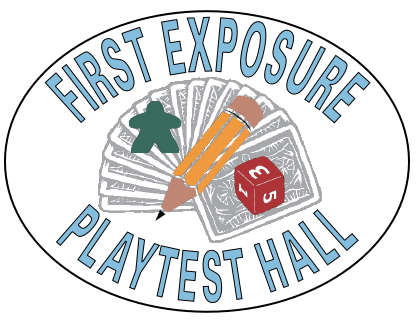 Join us for the seventh year of the First Exposure Playtest Hall, to be located in rooms 107 - 110, near the registration area at Gen Con 2019. Once you've registered as an Author, Publisher or Designer, we will work with you to schedule your events! For more information, send email to: firstexposure@dexposure.com.